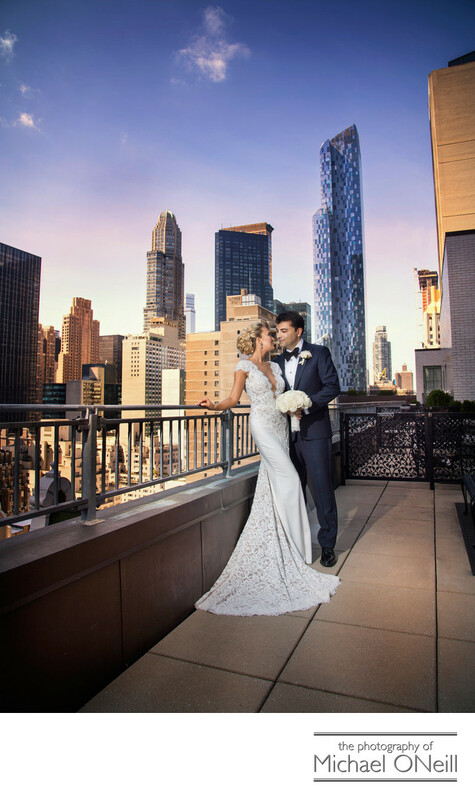 This lovely picture was taken on the balcony of the bride and groom’s residence at The Plaza Hotel; a two-story penthouse suite with panoramic views of New York City. This amazing venue on Central Park South in Manhattan is a landmark hotel in NYC, who’s reputation for excellence is recognized worldwide. This picture was taken right after the reveal, when the groom saw the bride for the first time in her absolutely stunning designer wedding dress accessorized with Christian Louboutin shoes. After these photos were made we descended to the elegant main lobby of The Plaza Hotel and created some amazing wedding photographs on the grand stairway. Then it was off in horse drawn handsome carriages to a special spot near Gapstow Bridge in NYC’s Central Park for some dramatic environmental portraits of the couple. Photographing weddings in NYC is a unique undertaking and requires an incredible depth of knowledge of the logistical considerations. This wedding saw us covering ground from Bethesda Terrace, at the north end of Central Park, all the way down to the chic SoHo section of NYC in southern Manhattan. When planning your NYC wedding be sure to choose a photographer who "knows the ropes" about getting around town as well as one who has all of the skill, experience and artistic vision to capture your special, unique event.